Shake once without and once with ice, double strain into a cocktail coupe (single old fashioned glass), and garnish with freshly grated cinnamon. 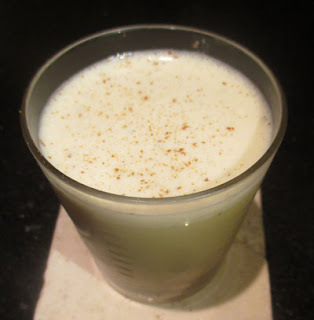 Two Sundays ago, I reached for the Cocktail Codex book and uncovered an Egg Nog variation called the Barnaby Jones by Maura McGuigan circa 2013. With Scotch, Cynar, and egg in the mix, I immediately thought of the delightful Black Diamond Flip, and the Scotch-amaro Nog idea reminded me of A Drunk in the Midnight Choir. Finally, the duo of Cynar and maple is one that has showed great promise in drinks like the Sherry Duval and the Mortal Sunset in the past, so I was game to mix this one up. Just as impressive as the ingredients list was the fact that Maura named this drink after an almost forgotten television detective series from the 1970s. Once prepared, the Barnaby Jones gave forth a dark roast coffee and cinnamon nose. Next, a creamy and sweet sip slid into a Scotch and maple swallow that also showcased the Cynar elegantly merging with the coffee flavors.